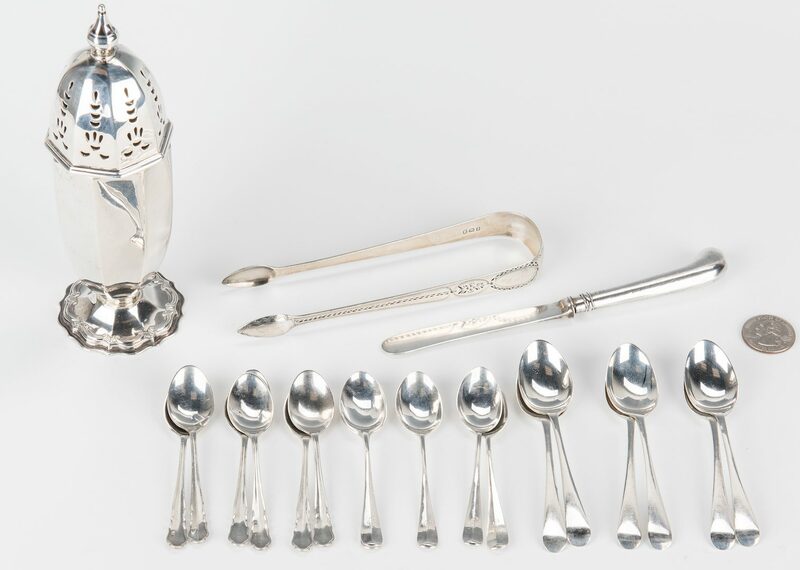 You are here: Home >> January 26, 2019 Historic Winter Fine Art and Antiques Auction >> Lot 860: English Sterling Caster, Tongs, Spoons, 20 Pcs. 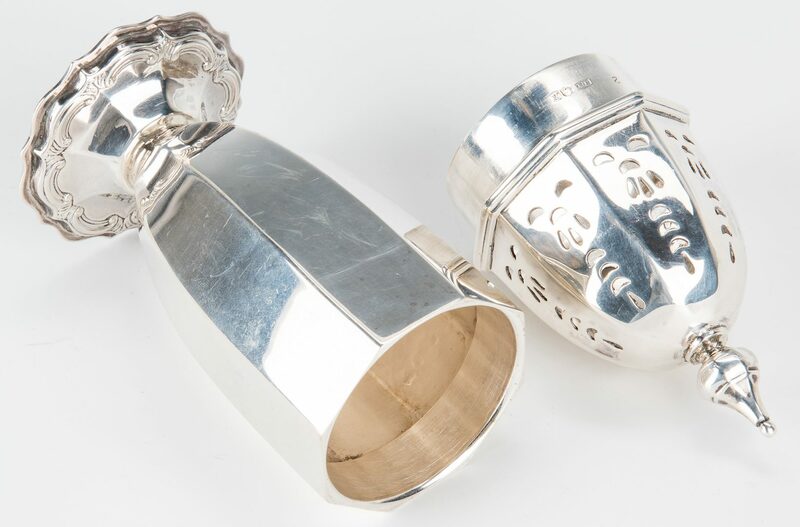 20 items sterling silver. 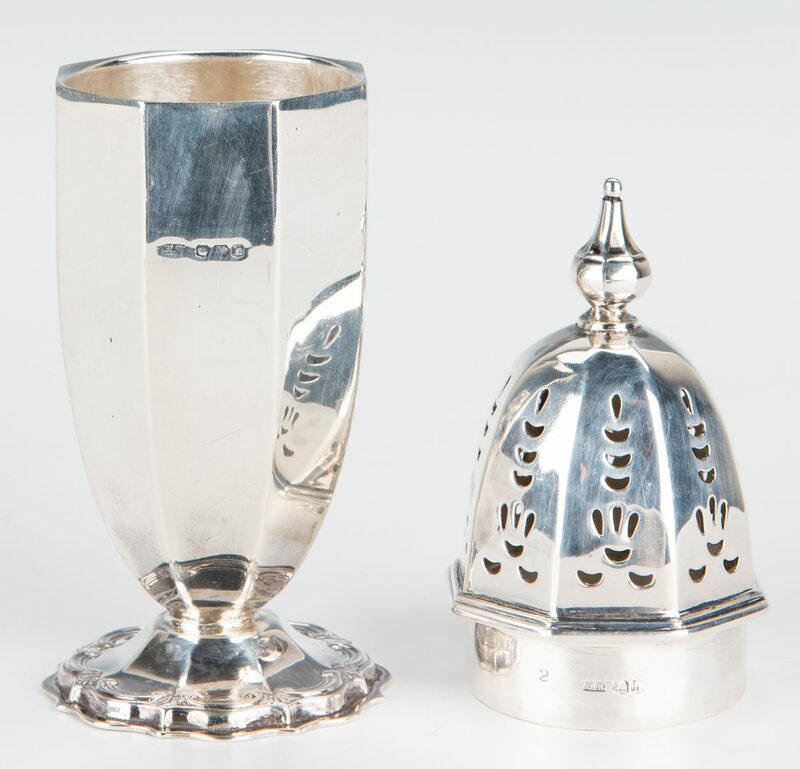 1st item: English Sheffield sterling silver sugar caster, octagonal in shape with a removable pierced lid with spire finial, maker’s marks for Henry Wigfull, date mark 1900, 7″ H, 5.215 oz troy. 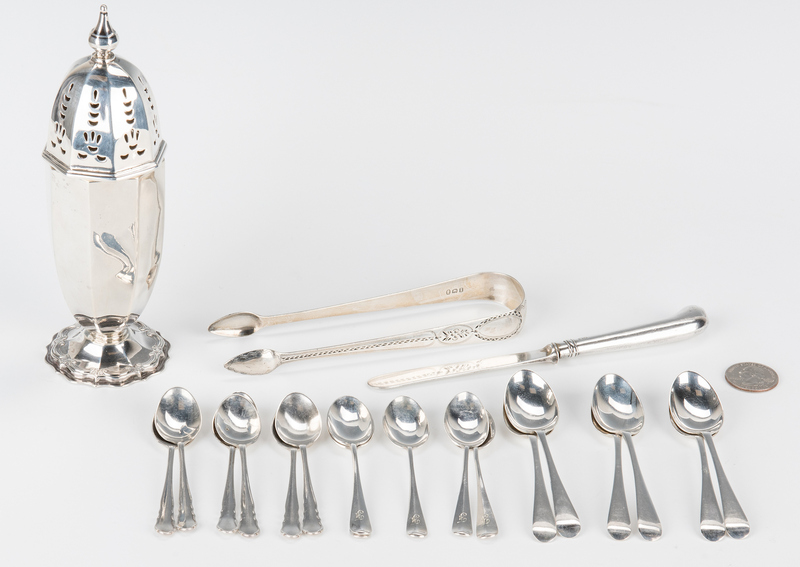 2nd item: English Georgian sterling silver sugar tongs with bright cut decoration, initials “ISN” at bend. 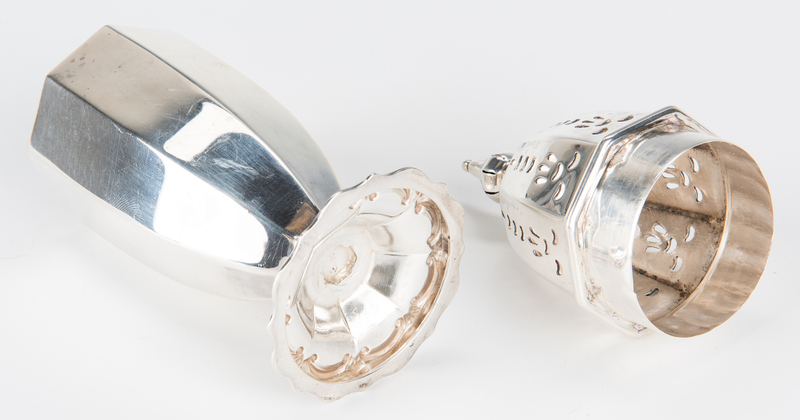 Partially worn maker’s mark “HS” or “SH” possibly Solomon Hougham, London, date mark 1804, 5 3/4″ L, 1.05 oz troy. 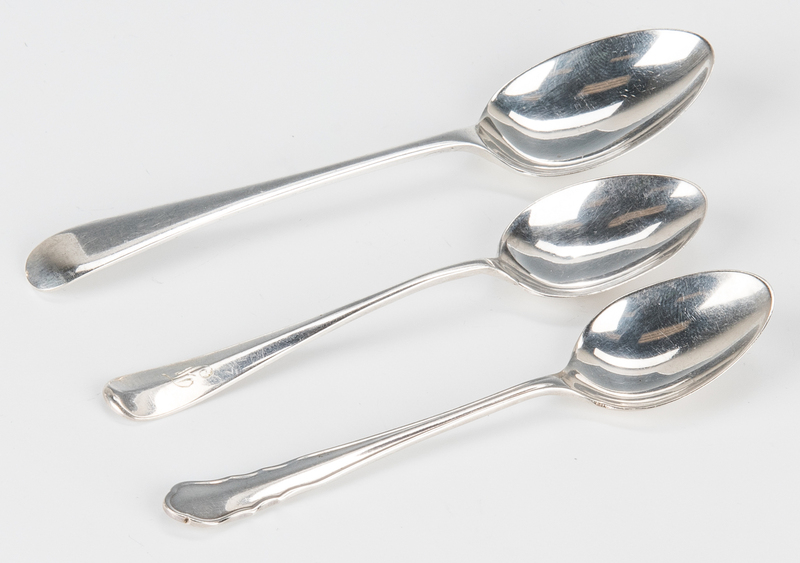 Set 6 English Sheffield sterling demitasse spoons with reverse tipt ends, 4 1/4″ L, 2.15 oz troy; Set 6 English Sheffield sterling silver demitasse spoons with swell tipt ends, 3 5/8″ L 1.64 oz troy; Set of 5 English Birmingham sterling silver demitasse spoons with rat tail tipts and monogrammed “F”, 3 5/8″ L, 1.06 oz troy (1 not shown in photos). 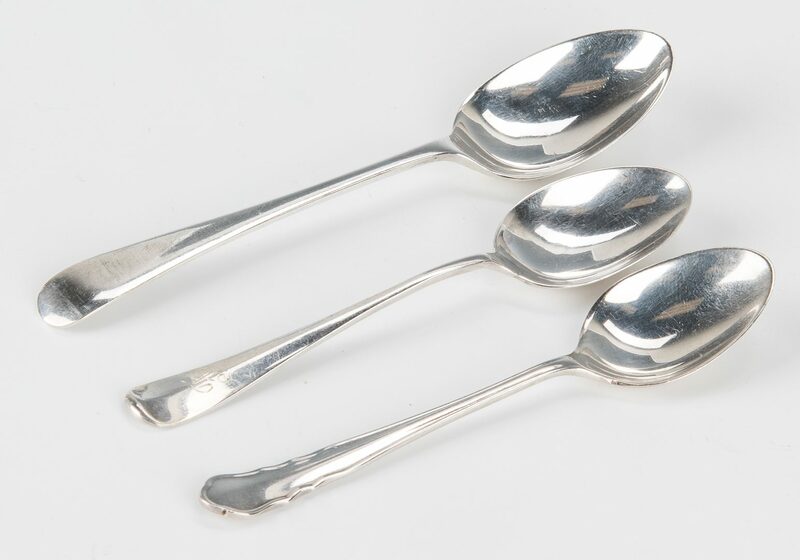 Group also includes one Wood & Hughes butter knife with weighted sterling silver handle and sterling silver blade, 6 1/2″ L. (0.945 oz troy including wtd handle). 11.115 total oz troy excluding butter knife. 20 items total. Provenance: Nashville, TN estate. CONDITION: All items in very good condition.